The Odyssey 100 was an analog system which used four Texas Instruments chips. It did not use cartridges and played two games: TENNIS and HOCKEY. A simple switch selected the games, and the system was either powered by six batteries, or by an AC adaptor (such power supplies were widely used by other systems). The Odyssey 100 was very basic and didn't have the common features of the million-seller PONG systems of the next years. The knobs were fixed: there were no detachable controllers yet. There was no digital on-screen scoring: the players marked their score using two little plastic cursors on the system. The serve couldn't be changed: it was automatic. This could seem strange compared to the first Atari PONG systems which already had digital on-screen scoring. In fact, this was just a question of technology. On-screen scoring would have required additional components, which would have increased the cost of the system. Nevertheless, on-screen scoring was added in later systems although the first attempts used archaic graphics. 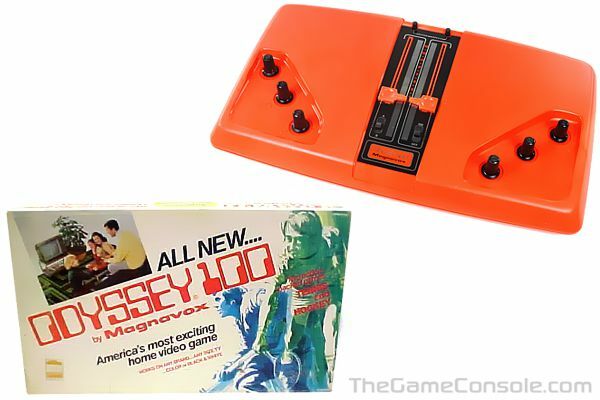 The first Magnavox system to offer digital on-screen was the Odyssey 300 in 1976.